Alternative? Not really. The highlight of the Flex 14 is surely its 300-degree swivel screen alongside the related multimedia and presentation options. 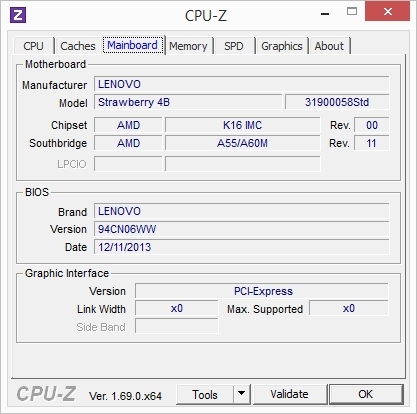 Lenovo now expands this product line with a weak AMD APU from the E-series. Why this concept does not work can be read here. The Chinese manufacturer now offers a Lenovo IdeaPad model dubbed Flex 14D with AMD's E1-2100 APU, which is based on the Kabini architecture and that was actually designed for small netbooks. Although it is considerably more energy-efficient than the weakest Flex 14 model with Intel's Celeron 2955U, it is also significantly slower. The buyer not only has to make compromises in performance, but also in other configuration matters: The battery's capacity has been reduced from 48 Wh to 32 Wh, which nullifies the lower power consumption. The SSD cache has also been eliminated. Thus, the buyer saves almost 200 Euros (~$275) when opting for the D model. There is some competition in this price and size category. Sony's Vaio Fit 14 that is also available with Intel's Pentium 987 (449 Euros, ~$619), or the non-touch Acer Aspire V5-473 (Intel Celeron U2955, starts at 365 Euros, ~$503) certainly can be considered. HP's 255 G2 sports the same APU, but cannot offer a touchscreen and is available for approximately 400 Euros (~$551). 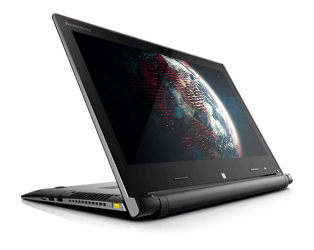 Information concerning connectivity, casing, and screen can be found in the review of the Lenovo IdeaPad Flex 14 since these parts are identical to the better-equipped version. Deviations in ranking are due to our new rating system. Lenovo's IdeaPad Flex 14D sports AMD's E1-2100 that is supported by 4 GB of working memory. However, it operates in single-channel mode so that performance losses are inevitable here. 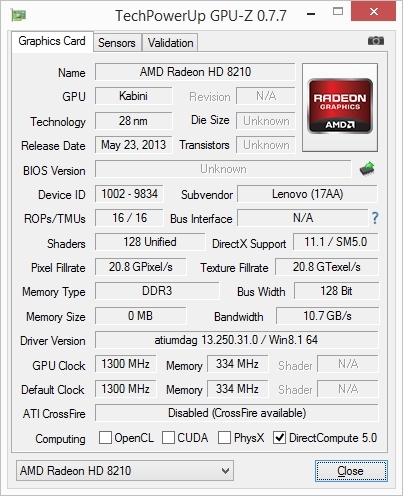 AMD's Radeon HD 8210 graphics unit is also integrated. A stronger AMD model (59409256) is available in retail. It sports an A6-5200 and HD 8400 with an otherwise identical configuration for just 50 Euros (~$68) more. 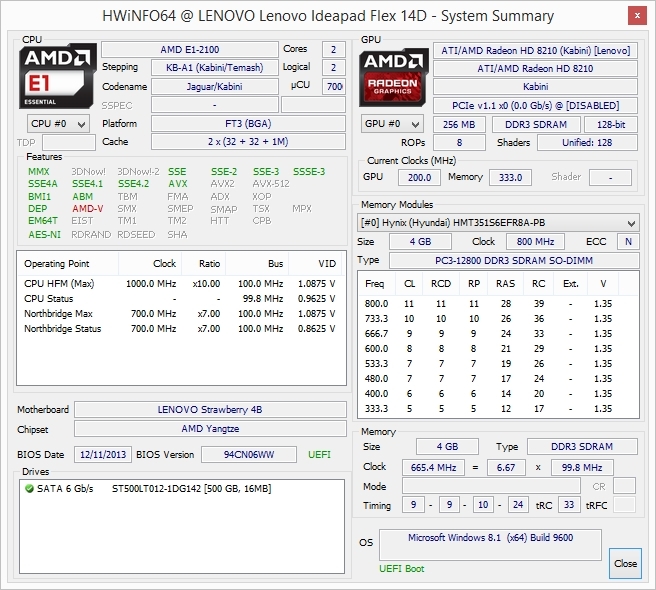 AMD's E1-2100 processor is used in Lenovo's IdeaPad Flex 14D. It is the smallest member of the E-series with two cores that both clock with 1.0 GHz. There is no Turbo or Hyper-Threading. The APU's maximum power consumption is very close to that of Intel's Atom processors with a TDP of 9 watts. 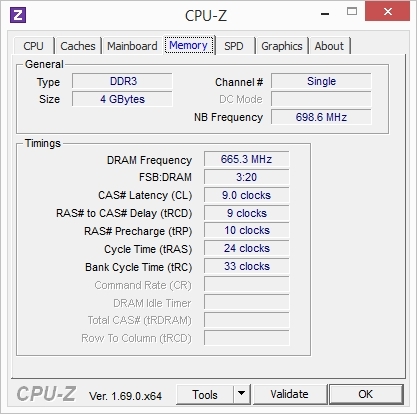 In view of the clock rate, it is doubtful whether the CPU's performance comes close to that of its contenders. 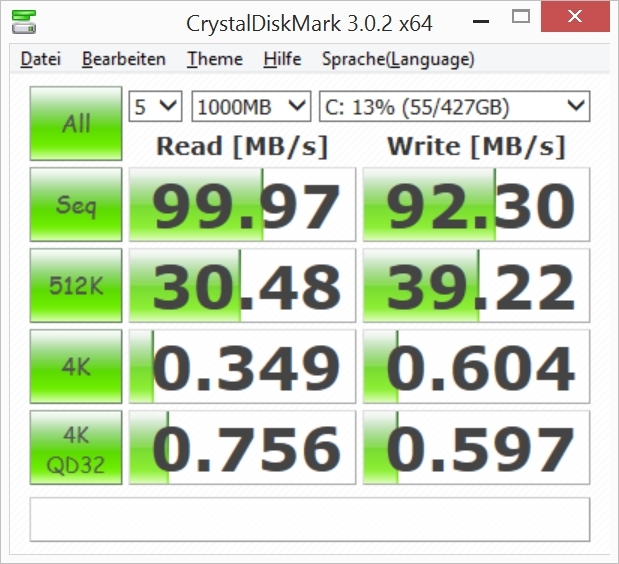 The benchmarks confirm the suspicion that the E1-2100's performance in Windows 8.1 would be abysmal. 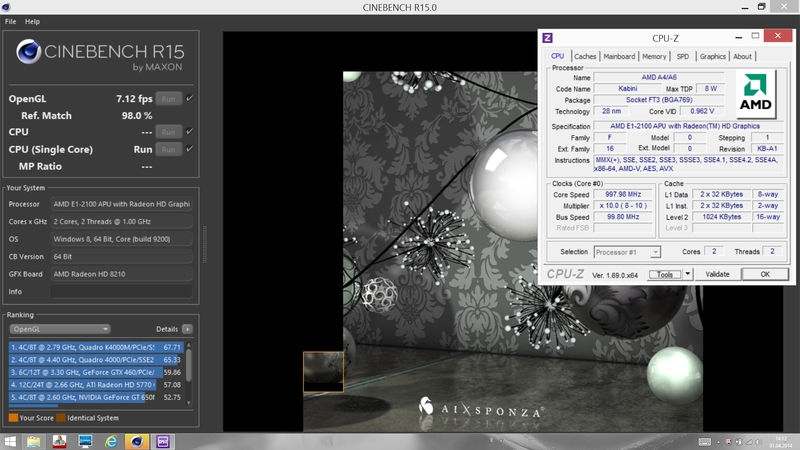 The convertible only just achieved 33 points in the Cinebench R15 multi-core test, and thus it even lags slightly behind HP's 255 G2 powered by the same APU (36 points). The performance difference to devices featuring a current Intel Bay Trail processor, such as Lenovo's ThinkPad 8, is also striking in 3DMark's Ice Storm Physics test. Since the Flex 14D is also available with an A6-5200, we compared the performance differences with a system based on this component. We recorded an impressive performance boost of 330% in the Flex 15D. The E1-2100 also makes a rather poor impression in practical use. A Full HD video was rendered smoothly after a jerky start even when the sound was simultaneously transmitted to a Bluetooth speaker. However, problems turned up when streaming Internet videos. We could not play a 720p YouTube video without massive image stuttering and sound overlays, even when streaming via Bluetooth. Streaming from more sophisticated websites like MTV was not at all possible. The APU's low performance is maintained in battery mode. It is not throttled. The system speed of Lenovo's IdeaPad Flex 14D is unsatisfactory. The long boot times of Microsoft Windows 8.1 (64-bit) would still be tolerable, but opening simple apps takes a fairly long time. The system occasionally even needs a downtime when switching directories in Windows Explorer. The Flex 14D simply makes a sluggish impression. PCMark 8 confirms the rather weak performance. Just 1535 points was achieved in the Home Score; the laptop is thus on the expected low level. A conventional 500 GB storage device that spins with 5400 rpm is installed in Lenovo's IdeaPad Flex 14D. The user has approximately 420 GB available after initial start. Unlike the Intel models with HDD, it does not sport an SSD cache. Nevertheless, the component's supplied performance is very acceptable, and it delivers a standard rate with a read speed of almost 100 MB/s. Nevertheless, a hybrid HDD or a full-blown flash storage drive would have contributed to the system's performance. Regardless whether in battery or AC mode, Lenovo's IdeaPad Flex 14D always has the graphics card's full performance available. 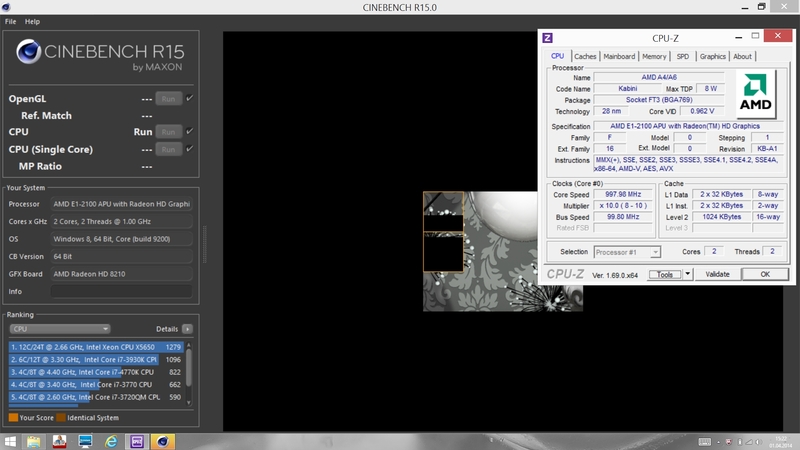 The integrated AMD Radeon HD 8210 is not a performance miracle, and it is roughly on par with Intel's HD Graphics (Ivy Bridge). 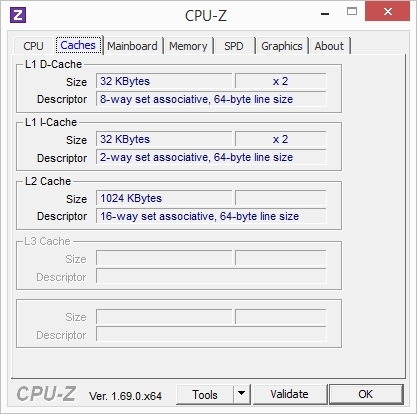 The GPU has 128 Shader Units and supports DirectX 11.1. The performance is not enough for up-to-date games. The CPU particularly proves to be another constraining factor. Since the card does not have a dedicated memory, its potential is also limited by the slow RAM. As expected, the review sample is close to the Aspire V5-131 (Intel HD Graphics, 22834 points) in the 3DMark Ice Storm Graphics test with 22421 points. However, the latter clearly excels in the total ranking due to its stronger CPU. Gaming is definitely not the specialty of Lenovo's IdeaPad Flex 14D. Current games, even relatively hardware-friendly ones like F1 2013, look like slide shows in the best case and are no fun. However, the system's moderate power is sometimes noticed even in games from the Windows Store. For example, we occasionally ascertained minor stuttering even in the graphically basic Last Heroes - The Last Stand. Classic games, such as Solitaire, ran immaculately even if it took a while for the app to open. Unlike HP's 255 G2, the fan in Lenovo's IdeaPad Flex 14D spins permanently. This cannot be changed in the BIOS. In view of the system's low performance we would expect that it would be possible to develop a fan-less design for the weak Kabini APU. Unfortunately, the cooling unit runs with a stable 32.6 dB(A) even in idle mode. Though that is not loud, it is well audible in quiet surroundings. The low-pitched, monotonous hum does get very distracting during longer use. The Flex 14 with a strong Core i5 is considerably quieter with below 30 dB(A). However, the noise level barely increases even during full load, and it reaches a maximum of 33.7 dB(A). The fan always drowns out the hard drive. 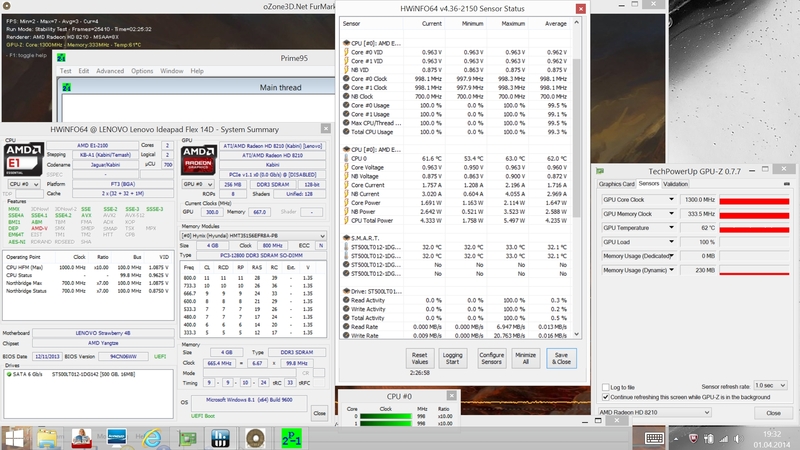 The low performance of the APU in Lenovo's IdeaPad Flex 14D has the big advantage that it barely produces waste heat. Consequently, the convertible's surface temperatures remain agreeably low in idle mode and only reach 28.5 °C. That is almost on par with HP's 255 G2 (28 °C). The rates do not increase much during load and reach a maximum of 32.1 °C. HP's contender (max. 34 °C) gets a bit warmer. Both ascertained rates are extremely low. The Flex 14D did not exhibit any weaknesses in the stress test. The components ran stably, and the consecutive test with 3DMark06 is virtually identical with the benchmark score in a cold state. (+) The maximum temperature on the upper side is 28.8 °C / 84 F, compared to the average of 35.4 °C / 96 F, ranging from 21.8 to 55.7 °C for the class Convertible. (+) In idle usage, the average temperature for the upper side is 24.9 °C / 77 F, compared to the device average of 30.3 °C / 87 F.
(±) The average temperature of the palmrest area of similar devices was 29 °C / 84.2 F (+1.8 °C / 3.2 F). 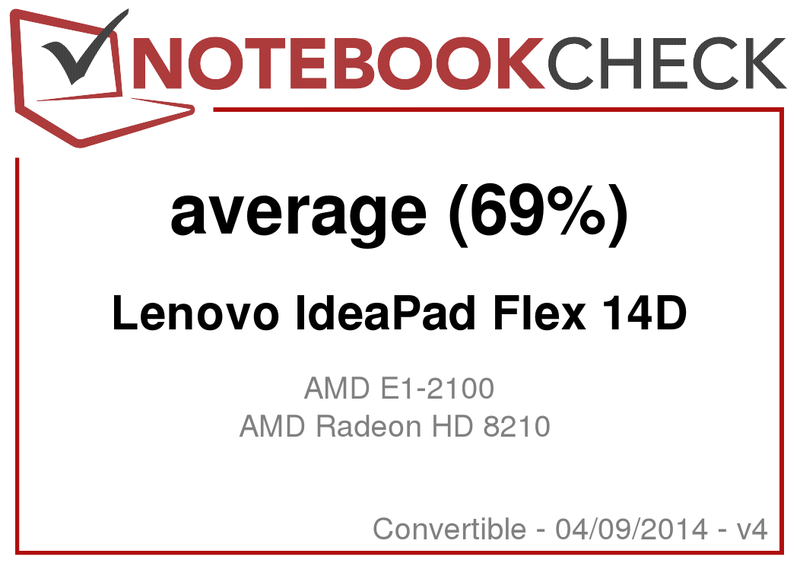 The APU in Lenovo's IdeaPad Flex 14D has a maximum TDP of 9 watts. The convertible's power consumption is correspondingly low. The device's idle consumption ranges from 7.3 to 11.2 watts when using the high-performance profile. The consumption rates climb up to 16 watts during full load and are still extremely low. It is thus on par with HP's 255 G2 (max. 16.4 watts). The power supply's output of 65 watts is completely over-sized for that. The battery in Lenovo's IdeaPad Flex 14D has a capacity of 32 Wh, which is much smaller than the battery in the Intel models (48 Wh). That is a bit too bad because the review sample's runtime could otherwise clearly surpass the in-house contenders seeing that the power consumption is considerably lower. The 41 Wh battery in HP's 255 G2 is also much bigger. 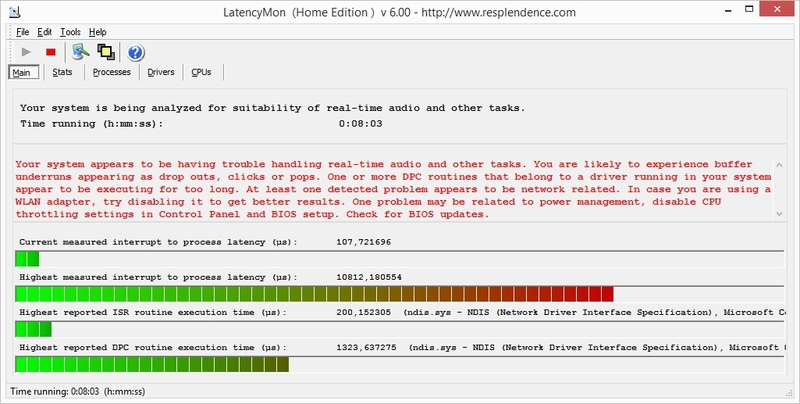 We use the Wi-Fi browsing runtime test for comparison. It is based on a standardized screen brightness of 150 cd/m², and all communication modules except the Wi-Fi module are disabled. A script opens a new website every 40 seconds until the battery is drained. The Flex 14D achieves a good result of almost five hours here but is still slightly behind the Flex 14 (5:23 h). HP's 255 G2 is defeated despite its larger battery (4:41 h). Unlike Lenovo's IdeaPad Flex 14, the Flex 14D that we tested here was not convincing. This does not affect the advantages of the series. The 300-degree swivel touchscreen is a nice feature that is normally not found in the lower price ranges. Its build is also impressive. The TN screen is a bit too dark but well illuminated and absolutely sufficient for indoor use. 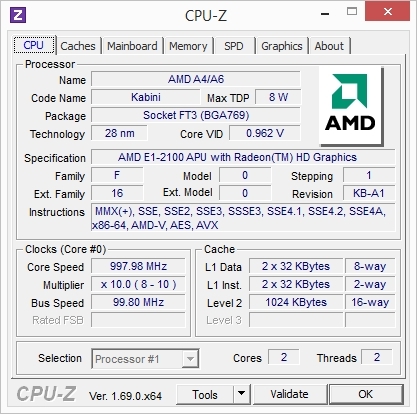 Unfortunately, this affordable model based on AMD's E1-2100 is very poorly equipped. Even an app like Solitaire needs almost 45 seconds before the menu is set up, and Internet browsing is unusually sluggish. Streaming HD videos should not even be considered. The weak laptop processor is simply overburdened with Windows 8.1, which is why we additionally lowered the device's score. Users who want to call a Flex 14D their own should pay the minor surcharge for the stronger model with AMD's A6-5200. The model with Intel's Celeron processor is also faster, and it is in the same price range. An alternative would certainly be Sony's Vaio Fit 14 with Intel's Pentium 987. The IdeaPad Flex's concept is compelling. The build and battery runtimes are also good. We would have hoped for a more viewing-angle stable screen for a multimedia convertible. However, that would still be tolerable if the device at least had enough power. We can't explain why Lenovo installs such an extremely slow APU in the Flex 14D. The extended app and browser loading times, and the impossibility to stream Internet videos, massively restrict the usability and they are simply no fun. The contenders are: Sony Vaio Fit 14, HP 255 G2, Acer Aspire E1-532 and Lenovo IdeaPad Flex 14.